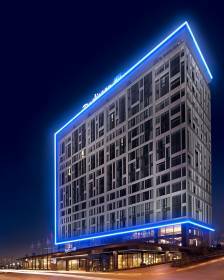 The Radisson Blu Hotel Istanbul Asia is positioned in the district of Atasehir, a modern residential area with bustling, high-rise businesses. A short distance from both major airports in the city and only 13 kilometres from the European side’s city centre, the hotel boasts the perfect location for busy travellers. Styled by the renowned interior designer, Sinan Kafadar of the Metex Design Group, the hotel’s 195 rooms feature contemporary decoration together with all added amenites and luxuries. The Radisson Blu Hotel Istanbul Asia offers 13 meeting rooms which include one 411 squaremeter ballroom that can be divided into two section, provide an ideal setting for everything from large conferences to small business meetings. The outdoor pool area can also be used together with 4 indoor events rooms for meetings, private functions or weddings.